The Higgins Firm was established to give the general public access to quality legal services. The law firm is separated into multiple distinct but interwoven sections to help serve its clients more effectively and to capitalize on each attorneys skills and knowledge. The main divisions include, catastrophic injury, nursing home neglect, medical malpractice and employment litigation. The founding members of the firm oversee the direction of these separate divisions. James "Jim" Higgins: Is the the founding member and director of the Castrophic Injury and Wrongful Death Litigation team of the law firm. 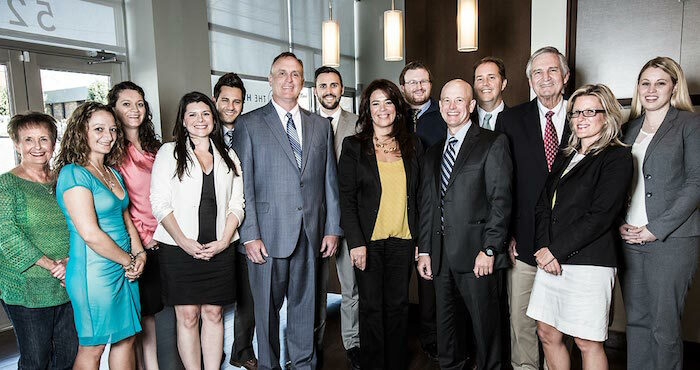 This team focuses on life changing work injuries, nursing home neglect, malpractice, car accidents, and premises liability lawsuits. Several team lawyers and support staff work with Jim Higgins who has extensive litigation experience with significant injury cases. Mr. Higgins began his career defending corporations and insurance companies but he has only represented victim of neglect for the past several years. He is a long time member of the Million Dollar Advocates Forum. This forum is limited to lawyers that have won million and multi-million dollar verdicts and settlements for clients. Mr. Higgins has litigated serious injury and wrongful death cases throughout the nation. Jon Street: Proudly graduated from the University of Tennessee and Wake Forrest College of Law. Jon focuses his practice in the field of Employment Law and Bad Faith Insurance Claims. Mr. Street has successfully pursued Wage and Hour (FLSA) Collective Action Cases Across the nation and is routinely associated by other law firms on complex employment law cases. He is a member of the Million Dollar Advocates Forum, MENSA (high IQ society) and an active supporter of the Boy Scouts of America. Rick Piliponis: Rick in charge of the firm's Nursing Home Neglect and Products Liability team. Mr. Piliponis graduated from the University of Tennessee and DePaul University School of Law. William W. Merrell: Bill graduated from the University of Texas in 1964 and from the South Texas College of Law in 1974. Bill also attended graduate school at La Universidad de las Americas in Mexico as well as the University of Madrid in Spain. Mr. Merrell is fluent in Spanish and routinely serves as an interpreter in court and for depositions. He is known in the Hispanic community as“El Abogado del Pueblo” or "The lawyer of the People" for his extensive legal assistance in the Latino community. He focuses his practice on work comp, car accidents and employment law. He is admitted to practice law in both Tennessee and Texas. Ben Miller:Ben graduated from Vanderbilt University and Wake Forrest School of Law. He worked in a highly regarded insurance defense firm for the first 10 years of his carrier defending complicated civil cases. He now works in the firm's nursing home neglect and catastrophic injury section. He is also a pretty good tennis player. Ryan Simmons:Ryan is a graduate from the University of Colorado School of Law. He is practices litigation in the firm's employment law division. Carrie LaBrec: Carrie is a member of the firm's serious injury litigation group. She attended Emory University, Belmont University and Willamette College of Law in Salem, Oregon.